The night enshrouded the barren woods, the many trees’ rotten, moss leaden, branches reaching out into the night sky, as if trying to grasp at the lazy light of the midnight moon that slipped through their claws and down onto the toadstool covered forest floor. The moonlight’s empty glow mixed softly with the velveteen blackness that clung silently across the grove, lending the area a gentle, stagnant, grey illumination that whispered of hollowness. The raven preened its dark feathers and flapped its now grey wings restlessly, giving a light caw of impatience as its beady eyes looked up at the cloaked figure that held it softly in its hand. Suddenly… the moon flickered. Vanishing into the darkness only to reappear again smaller… Weaker… The raven and the dark figure watched as it flared up in the empty night sky, and three streaks of light coursed out from it, scattering off into different directions through the chill night air. A wan smile appeared on the thin white lips of the figure, previously unseen tension sliding off his willowy body as he closed his tired eyes and gave a soft sigh. “And so it begins.” He whispered gently to himself, his tattered cloak billowing slightly in a soft night breeze. The raven gave a slight nod and opened up its wings, flapping them gently as easily as it lifted off the figure’s hand and into the dark, open, night sky. 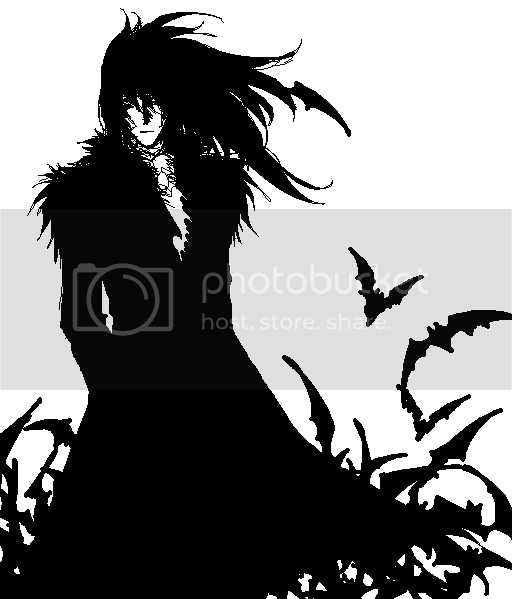 His tattered cloak billowed up softly as he finished, wrapping and swirling around him as it broke apart into a cloud of softly buzzing flies. The figure dissolved gently into the swarm as his body slipped away, flowing and trickling from the grove with the flies as if dark speckled water. The thought lingered softly in the quietness… Nothing more than a brief whisper in the void. What is it that is leaving? The words appeared again, struggling softly in the encompassing blackness… trying to form despite being tugged away into the hollow emptiness… trying to define its thoughts. The darkness settled in thicker into the softly fading words… pulling them apart. The words seemed to sigh gently along with the soothing darkness… flowing away and going along with it. Easing down… It was right… Nothing of concern… No problem… Only to let it fade away… to become part and one with the blissful nothing… Rest. The new crystal clear voice was different. Defined. Sudden. It caught the drifting words off guard. You know that isn’t true… You know there is something more. The words focused their attention on the new sound, pulling themselves together once more to answer the voice. The words cringed as it reeled away from the images, trying its best to answer through the soundless wails. The words separated slightly… Jarring away from one another…. Trying to fade away and disappear from the disturbing shades. The body’s eyes snapped open… It’s pale lips opening in a reflexive sudden gasp to taste the wet gentle rain that sprinkled down from the dark night clouds… It’s hands grasping at the soft mud that lay under it as it twitched and spasmed to activity on the damp forest floor. The once elven corpse tried ineffectually to sit itself off up the muddy ground it lay on, the arm that attempted to support the rest of the body losing strength halfway through. “Up. Don’tcha push yeself to ‘ard lad.” A withered and bony arm with surprising strength for its apparent frailness and age caught the young elf’s body from falling back down, supporting it up into a sitting position… “Wakin’ oop from ta dead ain’t easy, ya know.” The grizzled voice chuckled dustily from its own statement. The deathly pale elf turned his now red eyes to stare blankly at the kneeling, ancient Halfling who helped support him, the black goat hide headdress shadowing the sunken red eyes of the hunched halfling’s meeting the elf’s own. “I-I’m dead?” the young looking elf finally spoke once he had regained the use of his voice. The memories of a gunshot being fired filled the young elf head in a sudden burst, his head lowering simultaneously to look at his bare chest… At the bullet size hole in his now pale and cold flesh that was centered over his heart. His treasured golden locket swung gently next to it… Its usual gleam dulled from the stain of his dried blood. “No…” his small whispered intoned softly… his horrified eyes locked on the hole in his chest. The ancient and bony hand patted the elf’s young shoulder consolingly as the Halfling creaked into standing position, his aged and hunched back giving him little change in height as he leaned against his ornate staff. The young elf turned his head to follow the gesture of the skeleton-like hand of the halfling, his eyes falling on the tall and imposing hide covered shadow of the female giant standing silently and patiently behind him, towering over him. Her one red eye gleamed gently with impassive and quiet understand as it met the elf’s own gaze.